We present these photos of President Obama and Vice President Joe Biden wearing American flag-style shutter shades because it is clear the American people have been demanding to see Obama wearing Kanye glasses for years since he was crudely photoshopped into them way back in September 2008. We present these photos of President Obama and Vice President Joe Biden wearing American flag-style shutter shades because it is clear the American people have been demanding to see Obama wearing Kanye glasses for years since he was crudely photoshopped into them way back in September 2008. 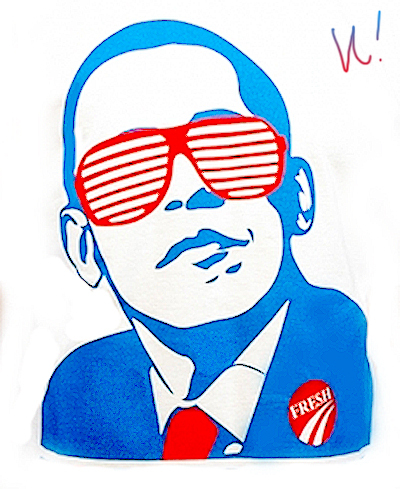 Multiple T-shirt designers have imagined the president in shutter shades. Now, the real thing is finally here. The photos were taken in Chicago campaign headquarters. The Biden ones were taken in July, when he got the patriotic glasses off a young staffer's desk and tried them on. I'm not sure when the Obama photos were taken, but they began popping up on Facebook and Reddit and my email inbox.